The Gigantic Nautical Flea Market reports that sales at the 2019 event, held the last weekend of February in Islamorada, FL, are up significantly over last year for many of their 800 vendors. According to the management, the ease of choosing space online through ConventionForce contributed to the vendors' success. "Many vendor's were 20%-30% over sales for last year and the love how easy it is to book our event," said Nicole Kraus, Event Manger. November 21, 2018 - TreasureFest launched a new online booking system to let vendors apply to the market from their phones, get approved and purchase space. Vendors choose multiple booth sizes and dates, and the cart automatically calculates additional fees. The new system combines two formerly separate processes - booth assignments and applications - and puts them together onto a single dashboard, where the manager reviews applications, automatically sends approval emails to the vendors, watches purchases roll in, and quickly places vendors on the maps. TreasureFest, a monthly outdoor marketplace in San Francisco, features crafters, vintage, food, antiques and loads of entertainment. $1 Million in Booth Sales! 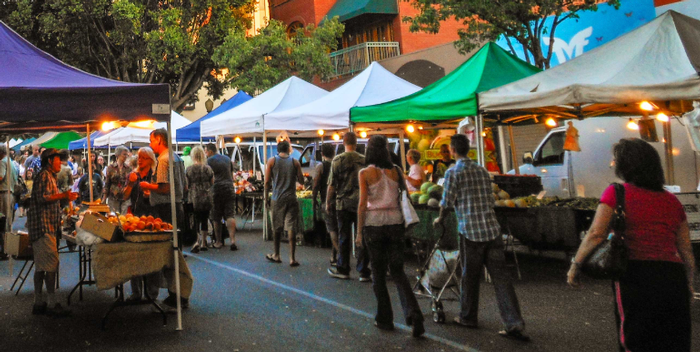 On October 25th, 2018 a cheese cake vendor buys a $65 booth and Redlands Market Night processes their millionth dollar through their automated online cart. Details to come!